This week’s author interview is with David Cassidy. 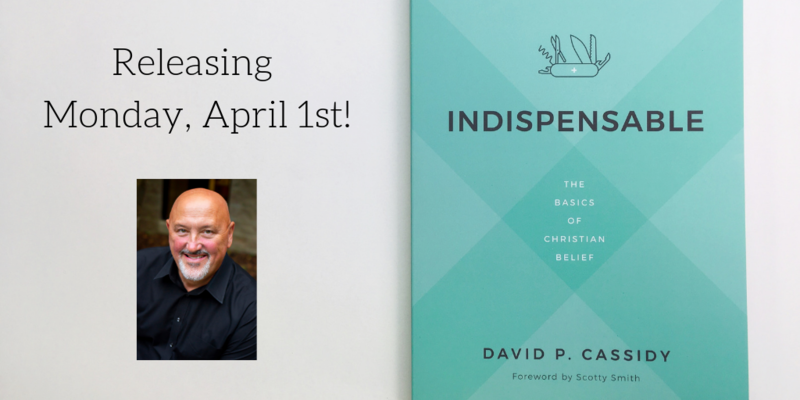 He is the author of upcoming release, Indispensable: The Basics of Christian Belief. That’s a parade of authors. From a literary standpoint, I’d say Dante and Shakespeare, quickly followed by Herbert, Donne, Dostoyevsky, TS Eliot, CS Lewis, Wendell Berry, Marilynne Robinson, and Robert Frost. In regard to distinctly Christian or Biblical matters, Leiva-Merikakis, Augustine, Herman Bavinck, John Stott, Tim Keller, NT Wright, Met. Kallistos (Ware), Arthur Wallis, Flemming Rutledge, and John Murray. Touching on the philosophical and historical, I’d go with Paul Johnson, Charles Taylor, and Francis Schaeffer. Cookbooks would be too many to name. I have a LOT of cookbooks! At the moment, I’m reading Diarmaid MacCulloch’s new biography of Thomas Cromwell, as well as a stack of books on the Holy Spirit in preparation for some writing I’m planning. And, as always, some works of poetry, right now by the late, great Mary Oliver. Did I mention cookbooks? Do you have a favorite quote? What is it and why? I tend to curate quotes and it would be hard to pick a favorite. I’d be better at picking favorites on various topics. On the Spirit, I love John Murray’s, “The fact that Pentecost cannot be repeated does not mean it’s been rescinded.” For a general life quote, I’ll go with George Bernard Shaw’s, ‘The reasonable man conforms himself to the world. The unreasonable man conforms the world to himself. Therefore all hope of progress rests with unreasonable people.” Neither are in the new book, which means I need to write some more! On cooking, I’m a Julia Child disciple. Her wisdom transcends the kitchen. I think I’ve just always wanted to READ books. Other people have said to me, ‘Write books!’ I find it daunting because a book feels so final in one way and I know there’s so much more to learn and whatever I have to say could be said so much more effectively by someone else. I knew I had to write books early on in ministry but never wanted to do so until the last few years. I hope I get to write many more, so long as they’re actually helpful. That would have to be John Stott and the reasons are as many in number as the books he penned. I’d summarize those by saying his work is consistent and careful, pastoral and practical, doctrinal and devotional, informative and inspiring. He wrote as a Pastor of a great church but also as a man deeply committed to evangelism, global missions, and the place of the Christian in society. He wrote with strong principles but held these in evident humility. Whenever I read his work – and I’ve read ‘Cross of Christ’ every year since its publication in 1986 – I come away with a deeper conviction of my need for Jesus Christ and his Gospel, together with a wider heart for the Church and love for people. John Stott keeps making a better human, Christian, and Pastor-Preacher out of me. I am so thankful he wrote and spoke with such passion and precision. Easy – the Chicago Cubs. I’m a baseball fan first, but love just about all sports, especially College Football, my Texas Longhorns leading the way on that front. I love to watch horses and eagles – there is a majesty and poetic beauty to their movement that’s enchanting. Domestically, however, that would be my Golden Retriever, Max. What a wonderful companion. Two, both passed on: a) Paul (obviously), because I could corner him on Romans; b) Churchill, at dinner, including Brandy and Cigars to follow. I’m cooking and he’s talking… epic evening for sure.